The SBA 2017 InnovateHER Competition is open to aspiring and emerging entrepreneurs with businesses representing innovative products and services that help impact and empower the lives of women and families. Through the competition, the U.S. Small Business Association (SBA) is seeking to amplify products or services that fill a need in the marketplace and have the potential for commercialization. As a local co-host to the competition, WEI adheres to the rules and criteria put in place by the SBA. Please click here for full rules and details on the competition. What stage is your business in? (You may choose more than one). Idea (I have a concept but have not started the business yet). Pre-launch (I am preparing to launch the business and have fundamentals (business plan, logo/brand, etc., in place). Launch I have gone to market with my business and am running it. Development/Expansion - (I have been in business for some time and am now growing the business/scaling it). Maturity - (The business has been in existence for more than five years). What else should we know about you? Please limit to 300 words. 100% woman-owned business, locally based, who resides in and/or is licensed to do business, within the city of Atlanta. A business legally registered at the time of the application to operate in the state of Georgia. A valid and up-to-date business license, on file, with the City of Atlanta, at the time of the application submission. The business must be early stage – it must have been in operation for a minimum of one year (12 months) but no more than three (3) years at the time of application submission. An operational structure/size that is ideal to the logistics and collaborative workspace environment of the incubator office space. Example: A children’s daycare would not be adequate to be housed in the environment of the incubator. Proven and substantiated adequate revenue generated from the operation of the business. Including the founder, no more than three people employed at the business at the time of application submission. Submission of completed application and agreement to all terms as stated in the application. Willingness to participate in an in-person pitch interview with the selection committee, if selected to advance to the second round of the competition. The 2018 WEI incubator application opens at 12:01 a.m. on August 14, 2017 and concludes at 11:59 p.m. on September 15, 2017. The written application is the 1st round of the selection process. Selected applicants will be notified in early October 2017, if their written applications have advanced them into the final round of the selection process. The final round of the selection process will require in-person interviews and a business pitch. The final round of the selection process will occur in mid-October 2017 and early November 2017 in Atlanta, GA and selected applicants will receive adequate notice of the dates/times of the interview schedule. 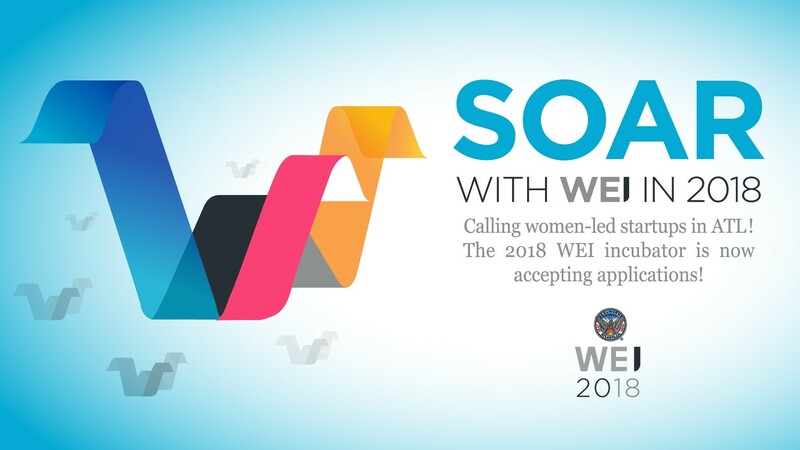 The WEI 2018 incubator lasts for 15 months, and will occur from January 2018 through March 2019. Selected applicants would need to be physically available in Atlanta, GA on or before January 1, 2018 to participate in the incubator. Please read the full press release announcing the 2018 WEI incubator here.